I had guided both these guy’s last year on the Bristol Avon and they went on to catch some good barbel to double figures. They had been following my blog and asked if I could help them out on the Wye. So we set a date where I would guide them for the first day to show them the swims and tactics and they could fish themselves for the second. We met on the services on the Severn crossing and soon travelling through the Welsh and English countryside. I had guided on the river on the Monday where is was up about a foot and coloured, today it was back down to the low summer level and very clear. The method was to be the normal hinders pellets and ground bait which is about there is on the market. We started fishing at about 8am and to be fair the sport was a while in coming. 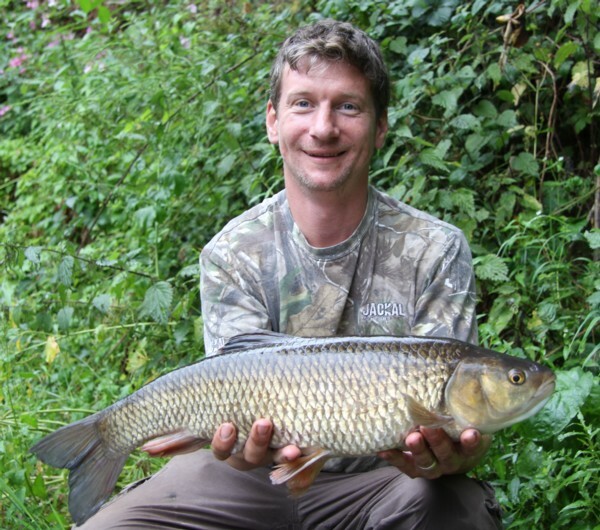 The chub were on the feed at regular intervals mostly around the 2-3 lb mark. 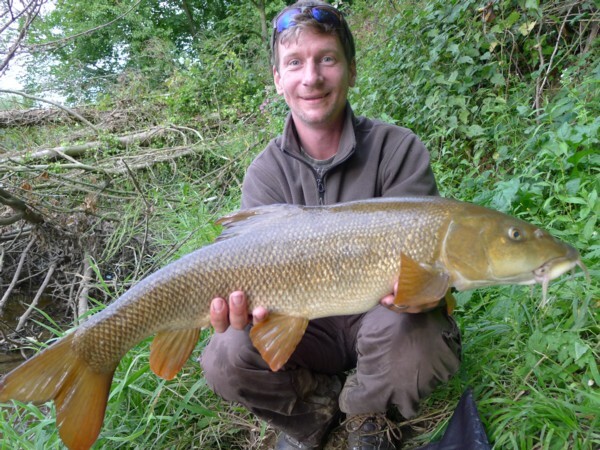 Steve was first to catch a barbel at 10am of 3 lbs or so. Then at 10.20 he landed the best looking chub I had seen from the Wye, it’s weight being 5lbs 12oz a beautiful fish. Things continued to improve as the day progressed until a canoe upturned upstream and a few bodies swam down through the swim. There was lots of splashing etc so I think that scared the fish for a while. They do not though take any notice of canoes and often one can be caught when a canoe is overhead of them. The way it normally goes is that the lower rod normally gets most of the fish but today it was the top rod that produced most of the fish. We chuckled what do I know! 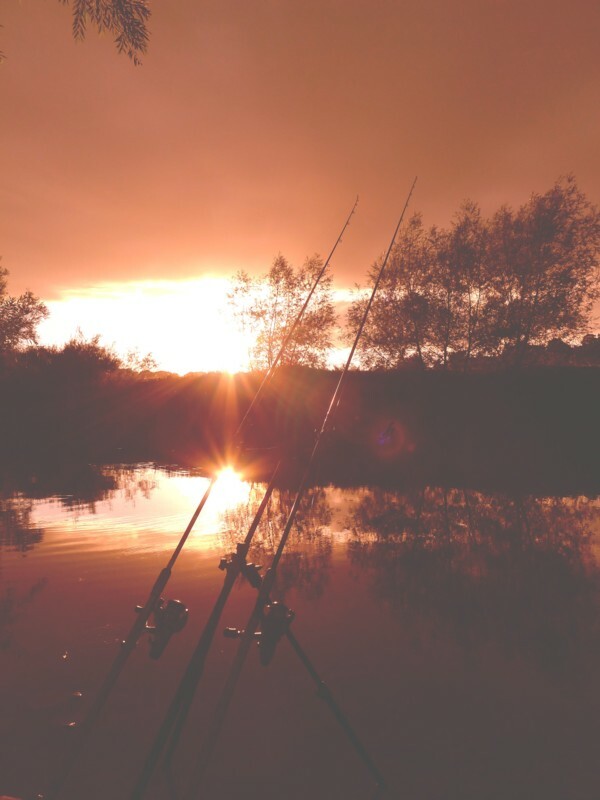 I was due to leave them at 6pm and by that time they had caught some good barbel up to 7lbs 14oz and had plenty of fun. The remainder of the tale is from them. They said that no sooner had I started the car they had a double hookup, with both fish being 8lbs plus. So in total for the day they had something like 18 barbel and 14 chub. So a wonderful days fishing.The next day saw them in the same swim again. This time the swim was even quieter in starting up. 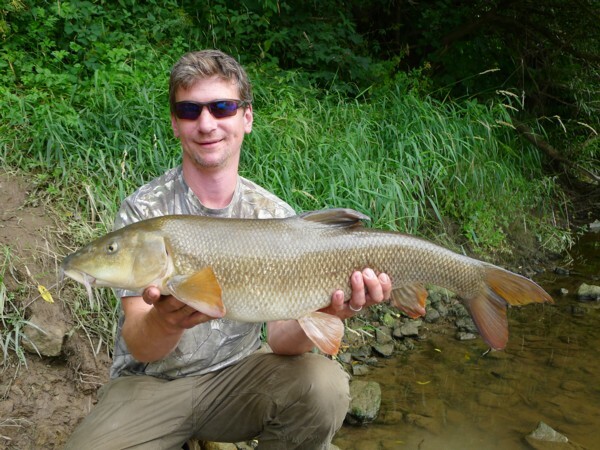 A couple of barbel were caught early then nothing much for most of the day. Again there were plenty of problems with the canoes. At one stage they told me that 5 people were diving in their swim looking for a camera that had fallen overboard. Now this does tend to disturb the swim. I told them though they should have asked the divers to retrieve a few 100 feeders that must be strewn on the bottom. They said that the canoe traffic was unbearable at times. 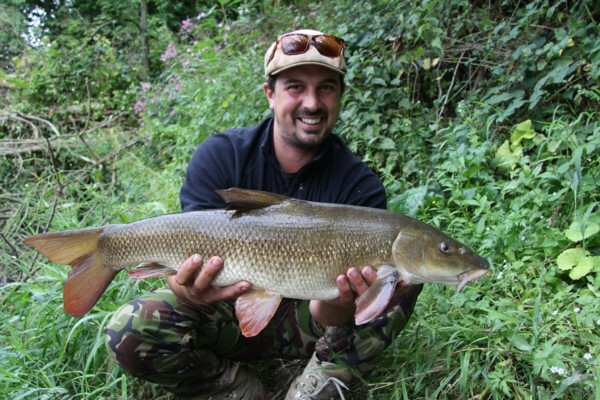 Needless to say when things settled down they continued to catch barbel once again. 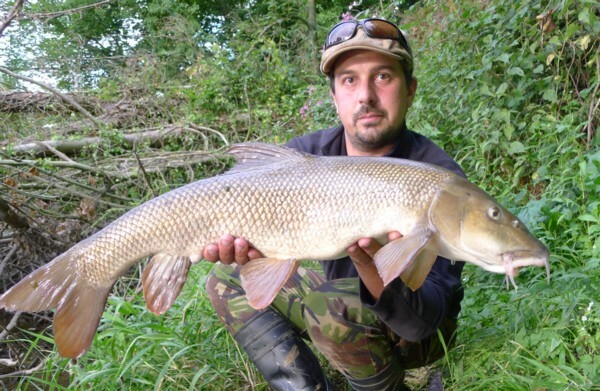 Steve had the largest barbel of the day at 10lbs 4oz. each also had an 8lber again. Today they said that most of the fish came from the lower rod for a change. Thats normal! So excellent fishing from the Wye. For Steve and Nick it was their first visit and I’m sure it won’t be the last. This entry was posted on Tuesday, August 27th, 2013 at 9:18 pm	and is filed under Uncategorized. You can follow any responses to this entry through the RSS 2.0 feed. Both comments and pings are currently closed.